The H Upmann Magnum 50 is a classic Cuban smoke, of Double Robusto format, 50 ring gauge, 6.3" (160mm) long and comes in 15 aluminum tubes. Very elegant, it has all the characteristics and taste of a H Upmann cigar. 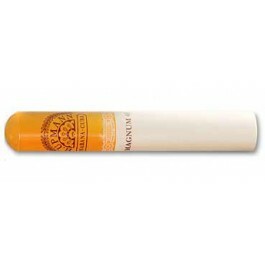 A superb cigar that any cigar connoisseur ought to try. Released as a Limited Edition in 2005, due to its huge success, Habanos decided to make it a standard production in 2008, to the delight of its many aficionados.